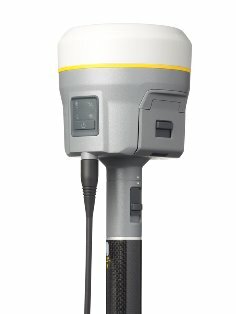 A new model of the Trimble® R10 GNSS system is now available. Designed to help surveyors in a wide range of industries work more effectively and productively, the Trimble R10 GNSS receiver enables reliable, fast and accurate collection of survey data in the field. - The latest and most advanced custom Trimble survey GNSS ASIC with an industry-leading 672 GNSS channels for unrivaled GNSS constellation tracking, including GPS, GLONASS, BeiDou, Galileo, QZSS, IRNSS as well as the full range of SBAS. The Trimble R10 tracks and processes all of today's available GNSS signals and is designed to support planned GNSS signals and systems that may be launched in the future. - Improved reliability against sources of interference and spoofed signals.Improved power management to increase battery life and operating time in the field on average by 33 percent. - Increased internal memory (6 GB) to store more than 10 years of raw observations. - Support for Android and iOS platforms to allow organizations with Bring Your Own Device (BYOD) environments to benefit from a premium survey GNSS receiver by using the mobile devices their field crews already have in their pockets. - Trimble HD-GNSS processing engine that enables points to be quickly measured with confidence. - Trimble SurePoint™ technology for precise positioning capture and full tilt compensation. - Trimble xFill® technology for centimeter-level positioning during outages.